It's been a good week, but it's definitely time for the weekend! To kick it off, I used a polish from Essence that I've been dying to try for a while. This is one of their newer Colour & Go polishes called Glamorous Life. Glamorous Life is a beautiful color. It's a bit deeper in color in person, and super shimmery. It's sort of a magenta color, and definitely is a bit more pink than it appears here too. Either way, it is an amazing color filled with shimmer! Application was very easy. The polish isn't too thick or too thin. If anything, it's a little on thin side, but that isn't bad - it's on the brink of being a jelly. I think it's nice that it's a little sheer because then the shimmer shoes through all of the coats, not just what's on top. I used two coats with no base or top coat for these photos. The brush inside the bottle is wonderful. It's a flat brush, but it isn't too wide or too fanned out like some others, which make it difficult to work with. This one is almost perfect, and I really didn't have to clean up much since I got the polish right where I wanted it. This is my first experience with any polish from Essence, and I have to say that I'm impressed! I enjoy this color, the formula, and how it applied. It dried quickly and is so shimmery and beautiful that I didn't even use my Seche Vite on it. You can view more of their color selection on the Essence website. Some are so pretty, I may just have to order more! This polish was provided by Essence for review. As always, I only offer my honest opinion. I had an incredibly busy weekend, so I'll apologize for my absence! I didn't stop moving from Friday until today, mostly because my brother was visiting, but I also had class, work, etc, so it's been exciting! Now, back to beauty! I realized that I hadn't done too much nail art since the 31-Day Challenge, especially something like water marbling. My first and only time had been during that challenge, so I decided to try it again with a couple new polishes! I've had these Wet n Wild polishes since I went to the Central Florida Beauty Blogger meetup. These were supplied by Wet n Wild who helped sponsor the event. The two colors are I Need a Refresh-Mint (218A) and Through the Grapevine (208B). I Need a Refresh-Mint is lighter in person in the bottle, and Through the Grapevine is a bit more purple than pink. These photos are a little more true to their colors, but still a little saturated. As you can see, my cuticles are a little flooded with polish since this was done with the standard water marbling technique. I did indeed apply Vaseline to my fingertips and around the nails, but it didn't help too much with the nooks and cranies, and cleaning up with a Q-tip just didn't cut it! Still, it came out pretty nice, and at least after cleanup my nails don't look too terrible! I like how the patterns came out on a few of the nails, namely the index finger, but all of them are really neat. That's one of the things I like about water marbling - each nail will be very unique! The Wet n Wild Megalast polishes held up nicely for water marbling, and they're very opaque. The polishes also have the very wide, flat brushes inside to make application easy (although that wasn't necessary here). I think I'll be checking out more of their colors! These polishes were provided by Wet n Wild for review. As always, I only offer my honest opinion. I never actually swatched my June Julep colors on my fingers! I usually swatch polishes on paper when I first get them, and then swatch the tops so I can see the colors when they're in my drawer. But I was itching to do some nail art, even if it was something simple! I did some dots with both Julep colors, Daisy and Robin. Daisy is the yellow color and Robin is the blue color. Robin almost looks green when it's over yellow! I know yellow + blue = green, but I thought Robin was a little more opaque than this. Both colors are very pretty, but actually a little thin. Robin is much better, and would probably give full coverage of a nail in one or two coats. Daisy, however, took three coats to cover my nails in these images. I was a little disappointed since it put a pretty good dent in my brand new bottle! I thought it was more opaque, so I didn't use a white base coat - but now I know! Still, the colors are beautiful. They were both in my Boho glam box, and I love them. It's hard to find a really nice yellow sometimes, but this one is perfect. It isn't shimmery at all, and it's more a jelly since it's so sheer - not really a creme. Robin is also beautiful, and is a toned-down turquoise sort of color. I used two different sized dotting tools to get this effect - one larger and one small (two ends on the same tool for me). The diagonal line of dots almost reminds me of galaxy nails! I have never done dots quite like this before either, so I really like them. They're something different, and so bright and cheery! I'll have to use more bright colors like this while summer lasts. So a while back, I received my beauty bag in the mail from Target Style. I was going to post about it because I was so excited, but I decided to wait until I had gotten a chance to play around the products so I could review them better! This is the bag this time. It is the same size, shape, and style as the last beauty bag from them, which was pink with stripes. This one is very pretty, and I absolutely love the shade of blue and the pattern on it! As for the items inside, I also love what I got. Garnier Fructis Color Shield shampoo and conditioner samples (0.34 fl oz) - I don't have color treated hair, but these promise to fight the fade and leave you with "bold color, even after 45 washes." However, as with most Garnier Fructis products, they smell great and left my hair feeling soft. I absolutely love fruity body washes and shampoos, so this is always a plus for me. Tresemme Split Remedy split end shampoo and conditioner trial sizes (1 fl oz) - Split ends are indeed something I have to deal with sometimes. While these are just trial sizes and I can't tell you how my hair is after long-term use, I can tell you that I did enjoy these products. They have a pretty boring scent to me, like that of your usual fresh scented salon shampoo. At least they also left my hair feeling very soft and silky, and were comparable to some Pantene products I've tried. I've never used Tresemme products prior to this, so this is a good experience for me. Aveeno Active Naturals smart essentials daily detoxifying scrub (1 oz) - I'm always willing to try new facial washes. I break out quite often, and have combination skin that goes from very dry and taut after washing, to very oily after wearing makeup. This scrub was very nice since it foams up a little, unlike some other scrubs, but also has some of that very fine, abrasive texture to it. It's a nice balance, and it didn't feel like this was filled with too many chemicals or harsh scents for your skin. Neutrogena Ultra Sheer dry-touch sunblock SPF 70 (1 fl oz) - For being SPF 70, this sunblock is indeed very sheer. It dried fast, and wasn't very oily and heavy like most sunblocks. I am very fair-skinned, and I live in Florida, so I will be putting this to good use! As for sun protection, I really can't say, but if it's SPF 70, I'll trust that it's good, since it's a little hard for me to analyze that! Revlon Color Burst lip color in peach parfait - This item is a little 1-3 use sample (the card between the Neutrogena and Tresemme in the image). I was sort of hoping that we would each get a full size lip color with the way they advertised the beauty bags, but for free, I won't complain. As for my color, I got peach parfait, which is a lovely coral sort of color. It isn't too sheer, and it isn't too bold. I actually got three uses out of this sample, and applied it with my finger. It felt nice, looked nice, and now I want to buy the full size! The bag also came with another coupon booklet with coupons good at Target. It has coupons for the full sizes of these items and even more from other companies and sponsors. Looks like I'll be stocking up with some summer beauty savings! All in all, this is another great bag - both the bag itself and the contents. I am very satisfied with everything I received, and I hope Target can give out more of these in future seasons! If you would like to know when they plan on sending more out, check out the Target Style Facebook page. A lot of other nail bloggers are doing "Try it Out" Tuesday. I'm sort of following with that since this is yet another polish that I haven't tried before, but I'm not sure I'll be able to do it every Tuesday! I'll have to do more epic manicures, nail art, and just plain everything on my weekends. Still, for today's never-before-used polish, I have Almost Paradise, from the Deborah Lippmann Footloose collection. I ordered the lovely Footloose collection from HSN not too far back. They were on clearance for $9 or so per pair - so like $5 per polish! This one came paired with Footloose, which I posted about last month. As much as I love Footloose, this has to be my favorite from the collection. Almost Paradise is a very light green color. It is a cream, with absolutely no shimmer, but that doesn't make it any less beautiful. The color ultimately reminds me of key lime pie! The photos are all of two coats of Almost Paradise, topped with one coat of Seche Vite. My first coat was petty thin since I didn't apply too much, and it was very sheer. I applied more in my second coat so I could achieve full coverage in two, and it worked well. I was tempted to just do three thin coats total, but these two worked! 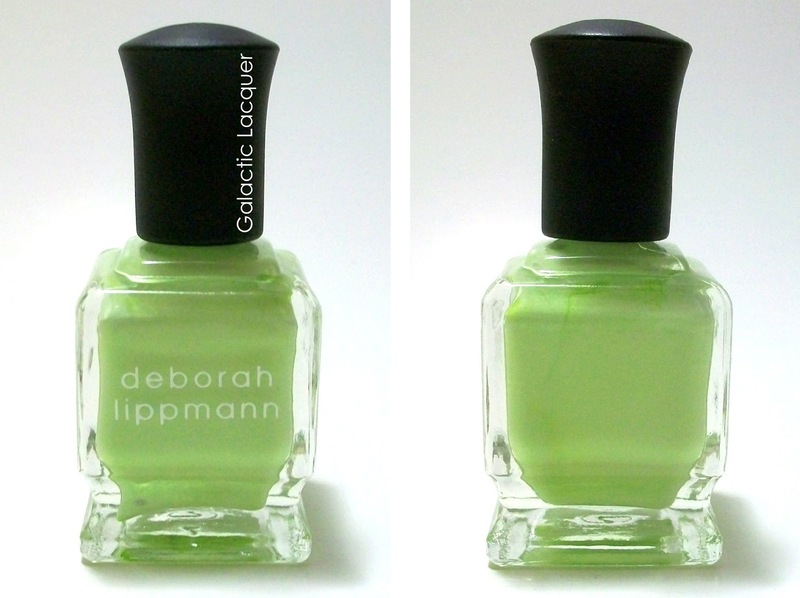 Application was very smooth, as it is with most creams or Deborah Lippmann polishes. I only have a few DL's, but so far I love the formula. They go on very nicely, dry nicely, and the colors are just fantastic. I will be buying more whenever they're on clearance again, but I may not be willing to pay full price yet! All in all, this is a great polish. This is a very unique shade of green for my collection, so that's also probably why I enjoy it so much. It's such a simple and refreshing color, and using a creme after my Indie Week (mostly glitter) is also a nice change! Every time Julep offers mystery boxes, I've been so incredibly tempted to buy one. I've refrained every time, but I finally caved and got a June mystery box. With their promo code, it was $20. I didn't get one of the huge, special boxes, but I did get some nice products! I didn't take a picture of everything wrapped up all cute - I was way too excited to see what I had got since it is totally random. But, here are the contents of my box! I got Julep Elixir, three polishes, and a Julep nail file. The polishes I got are actually very pretty. I didn't receive any duplicates since I only has four Julep polishes prior to buying this mystery box. From top to bottom: Sandra, Natasha, and Heather. Sandra is a beautiful, opalescent pinkish-magenta color. Natasha falls somewhere between orange and coral. It appears very orange in this photo, but in person it's more on the coral side. Either way, it's unique and gorgeous! Heather is a metallic silver color. It is a pretty dark silver, and has some brownish undertones to make it appear much warmer than most shades of silver. The Elixir is something I have never tried from Julep before, so I'm pretty glad I got it. It is organic Moroccan argan oil, and comes with a glass eyedropper, which screws onto the bottle so it can seal with it kept inside. I haven't gotten to play with it much yet, but apparently it has several uses, in places such as cuticles, nails, skin, and even hair. I will probably end up using it more or less as cuticle oil, but will try it in the other places to observe the results. I opened it and applied some to my hand, and after rubbing it in, it didn't leave my hand greasy. It also appears to be unscented, or I'm just too stuffed up from allergies to tell if it has a subtle scent. All in all, I'm glad I got to cure my itch for a Julep mystery box. I think it's pretty fun to see what you end up with, and I may end up buying another one when they offer them again! As long as they're $20 or so, I suppose I can try my luck again! For today's Indie post, I have a polish that I bought from Lacqusitry long ago, and actually never used! I got this one back in March, and it's been sitting around since. I've been eyeballing it now and then, but just couldn't decide what to put it over since it's sheer on its own. (This happens a lot with glitters I have!). As you can see, Spun Sugar is a very pale pinkish color. It is filled with glittery goodness, and glistens in the light. It has some small hex glitter, but most of the glitter in it is super fine. It isn't rainbowy holographic, but more like opalescent shining glitter. I applied one generous coat of Spun Sugar over two very thin coats of Revlon's Pink Chiffon. I probably could have made the base less sheer, but I think it still turned out very nice. The polish is very pale pink for the most part here, but shines a brighter pink in direct light. 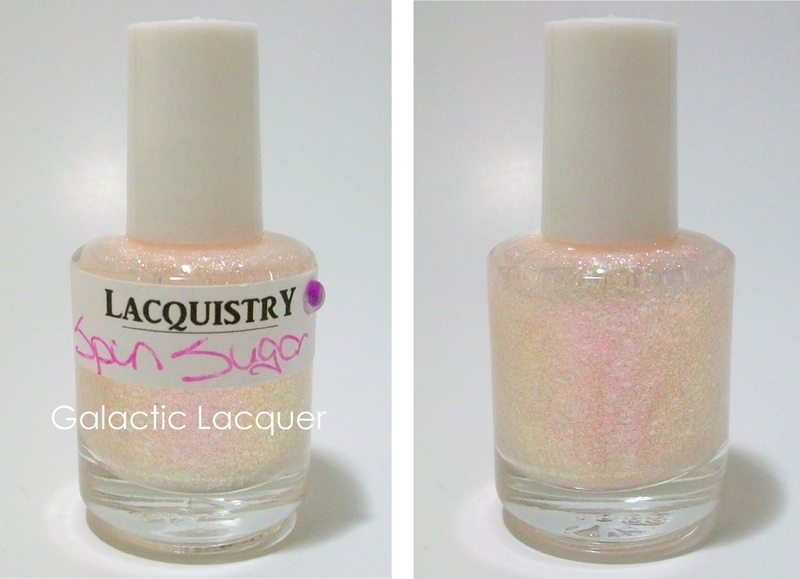 This is such a beautiful polish, and it does indeed look like spun sugar or cotton candy! It almost reminds me of some sparkly but soft bridal colors or polishes. I'm not sure exactly, but I almost want to eat it, and I definitely don't want to take it off! As with most polishes from Lacqusitry, this one is wonderful. I have quite a few of her polishes from her Etsy shop, but I'm unsure of the last time she had restocked for the general public. I know she has been doing a lot of custom orders, so she must be busy! Either way, Jenna is an absolute doll to work with, and I love her polishes. I look forward to getting more polishes from her! For today's indie, I have another one that's been sitting around for a while, and I've been dying to try it. I just didn't know if I should use it alone, put it over a base color, etc. I finally decided, but I think this polish is very versatile and would look great alone or over several options. That polish is Cha Cha Twist by All That Glitters. Cha Cha Twist is a bluish-clear base with lots of glitter in it. It has large turquoise hex glitter, red squares, smaller turquoise glitter, and even some bar glitter. It has quite the array of glitters, but the blues juxtaposed with the red glitter really makes it pop. It was difficult to choose a base color for this, but I went with a deep blue color. I used KleanColor - Neon Sapphire, and then applied two coats of Cha Cha Twist. It's all topped with one coat of Seche Vite. Application was pretty easy. The polish applied smoothly, and I didn't do any glitter manipulation - the glitter was evenly distributed on its own. I also didn't have to fish for any larger glitter, as that also came out and applied with the rest of the polish easily. Unfortunately, my camera is still having difficulty focusing on very glittery, textured manicures, so these pictures do not do it justice. The glitters are very shiny and holographic in person, and the turquoise and red really shine and look amazing over the darker blue polish. 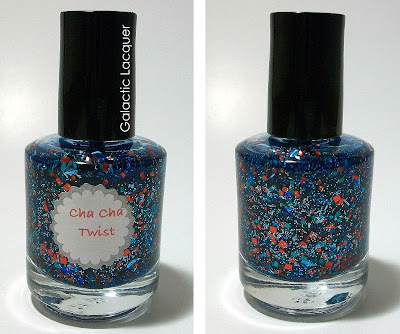 If you would like to buy Cha Cha Twist, you can find it in All That Glitters's Etsy shop here. All That Glitters almost always has something in stock, so it's a nice change from having to rush and wait for restocks like with other indie makers. I have gotten a few All That Glitters polishes, and I would definitely recommend them. As promised, I'm doing two posts today to make up for my absence yesterday. 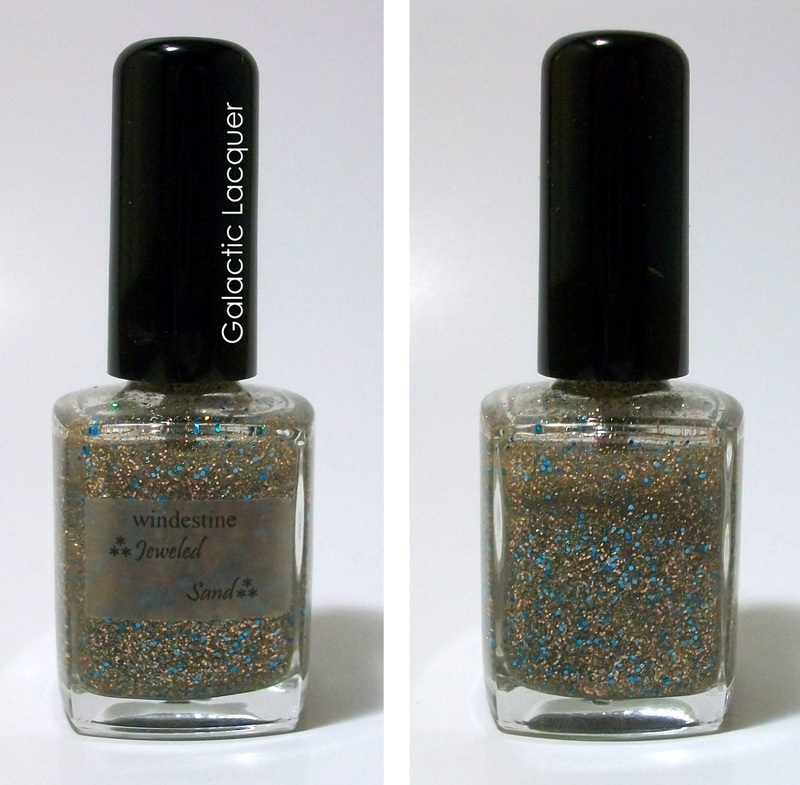 For the next Indie, we have a polish from another well-known maker - Pretty & Polished. I absolutely love Pretty & Polished polishes. I have been buying from her since I first discovered her on Etsy, around when my nail polish addiction began. I own tons of her polishes, and the quality and variety never let me down! For today's polish, I chose Tart. I've had this polish for a while, but I haven't ever used it until now! I figured it would be a good polish to include in Indie Week. 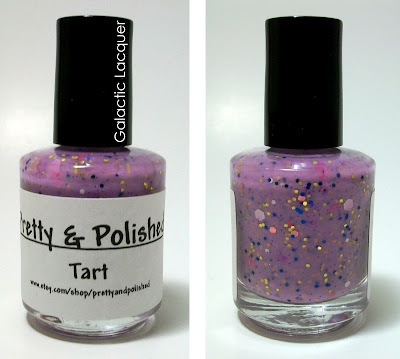 Tart is a purplish base with lots of glitter inside. There are large white and magenta hexes, along with much smaller white, gold, and blue hexes. The whole polish is slightly shimmery in the light. This is two coats of Tart topped with one coat of Seche Vite. I did not use a base coat. One coat was pretty thin, but two made it very opaque. The polish isn't opaque enough to be entirely a creme, but isn't clear enough to be a jelly. It falls sort of in between, but barely. It's just another very unique polish from P&P! The shade of purple is pretty amazing in my opinion. Purple has been growing on me recently - I've gotten more purple clothes, purple eye makeup, purple polishes, etc. I love this light shade of purple for all of the above! Application was smooth as usual. I did no glitter manipulation, so glitter was very evenly distributed with just two coats, applied normally. The polish in the bottle is also impressive, since P&P also now mixes larger batches and then fills the polish bottles. This makes it so the glitter is in the polish, not stuck on the sides. Her method is great, and her polishes are great! I definitely recommend any of them. You can check out Pretty & Polished on Facebook for future updates, and also check out her Etsy shop so you can be updated when she restocks/reopens. Indie Week continues! I apologize for not posting last night. I had some unexpected guests, and we all went out to eat, see a movie, etc, so I didn't get home until really late (or early?). I had a good time, but I will be making up for yesterday's post tonight - I'll be posting two! First up, we have Celery Stalker from Paris Sparkles. Paris Sparkles is what I consider one of the lesser known Indie makers. She has a shop on Etsy, and sells lots of beautiful polishes. I have actually bought several from her, but this is my first time posting about it. I will be sure to do more! As you can see, Celery Stalker is a beautiful green color. It appears pretty minty in the photos, but it's a little more on the greenish-yellow side in person. Still, it's a light green polish with some colorful glitter in it. There isn't too much glitter in it, but I actually like this in some polishes - it's cute, but not overdone for when I'm not feeling the crazy glitter vibe. This is two coats of Celery Stalker with one coat of Seche Vite on top. The polish is pretty opaque, and a third coat is probably not necessary. It applied smoothly, and I'm really impressed with the subtle shimmer it has in direct light too. The colors of the glitter are nice too - purple, blue, yellow. I would definitely recommend this polish. You can check out ParisSparkles's Etsy shop here. She almost always has tons in stock, and she has so many different colors and glittery polishes to choose from, it's amazing! Indie week continues! It is only the second day, and I'm having trouble picking what ones to use for the week! I actually have so many indie favorites that I want to showcase, and lots that I haven't even swatched yet, so it's hard! 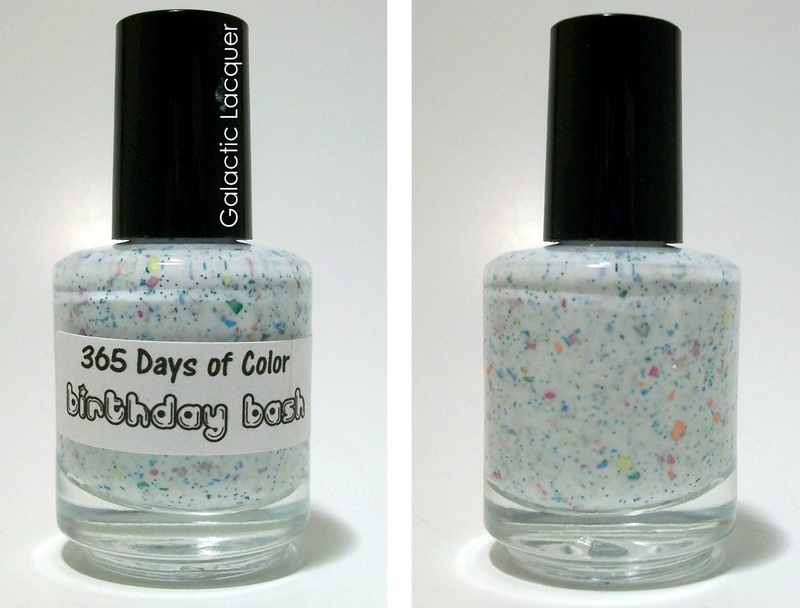 But for today, the choice was easy - Birthday Bash from 365 Days of Color. Birthday Bash is an amazing polish. I absolutely love white polishes with glitter inside, no matter the color! But this one has some pretty crazy glitter - the larger colorful pieces are multicolor shredded glitter, all suspended among tiny turquoise glitter. The difference in size, shape, and color definitely makes it look like confetti from a birthday bash! This is two coats of Birthday Bash, topped with Seche Vite. I didn't apply very thick coats, and I got full coverage! I did not use a basecoat, so two coats and this polish was completely opaque. This polish really reminds me of Jawbreaker from Pretty & Polished. If you love that one, then you'll love this one! The colors in this one are much brighter, such as bright orange and purplish pink, instead of reds and greens in Jawbreaker. The white base in this one is also a bit more opaque, so both are still very unique. Application was very smooth, and I absolutely love the end effect! I did no "glitter manipulation" either - I just applied the polish and the distribution of shredded glitter pieces was pretty even. Also, notice how nice my cuticles look today? 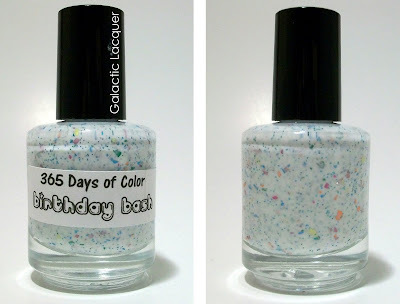 I got to try a sample of Miracle Balm from 365 Days of Color too! I got this sample from my purchase of Birthday Bash, and she has since released full sizes in over 20 different scents! My scent was random, but I am so happy with it. For being a melon scent, it is very strong, but smells spot-on. The whole thing is basically a little pot of cuticle balm, and I applied some to my fingers before taking my photos. They look a little shiny since I took the photos directly after, but they are not greasy at all. The oils get absorbed, and my fingertips look fantastic now. I will definitely be buying this in more scents! 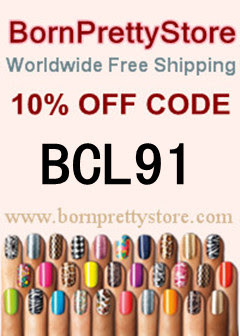 If you would like to purchase polishes from 365 Days of Color, you can check out her shop on Big Cartel. She has Birthday Bash, American Spirit, and two whole collections of other polishes, all among her brand new Miracle Balms. 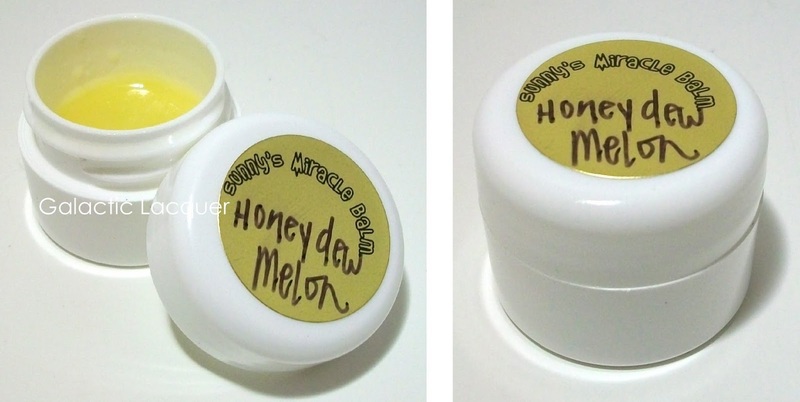 The balms are available in sample and full sizes, and her polishes are also available in mini and full sizes. Excuse me while I go purchase some more!